Looking for an alternative to plastic pitchers this summer? 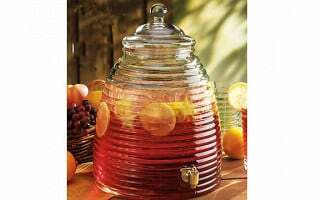 Take a sip from the Beehive drink dispenser, perfect for serving lemonade, sun tea or sangria. The classic beehive shape makes your beverage the centerpiece by showing off fresh fruit and herbs that are kept cool inside the generous but not massive glass jar. Constructed of hefty ribbed glass in a cool retro style, the Beehive dispenser has a wide mouth that makes it easy to fill with beverages, ice, and sliced fruit, and also a cinch to clean. The easy-pour spout controls the liquid flow so there’s no mess. It holds two gallons, so it’s large enough to accommodate a group but still fits nicely on a countertop or patio table. Whether you’re serving a crowd of thirsty guests or looking for an irresistible hostess gift, the Beehive drink dispenser is an elegant way to show off your style. I'm Connie Retek President of Classic Hostess. We source a full line of drink dispensers, barware, and other tabletop accessories. The Beehive Drink Dispenser is one of our favorite drink dispensers with its uniquely appealing styling and durable functionality. You will love having this as the centerpiece of your beverage center. We are happy to have it featured today as a Grommet and are available for questions you may have. I love the look of this beverage dispenser. can you tell me what the spout is made of? Margaret - It is made of a very strong plastic and is BPA free. super cute. do you find that fruit or other non-liquid items plug up the spout at all? If its a blended drink and there is pulp from the fruit, it might clog the spigot. It is great fro lemonade, sangria, ice tea and etc. Thanks Connie. I'm definitely getting it. Our company has a bee for its logo so it'll be perfect at our events. Thanks! We often have a yard full of kids. I love that this could be a self-service drink station for them so they don't have to drag dirty feet into the kitchen but it's also nice enough that it could be used for a dinner party. How often do you find that the drink needs to be stirred-as with lemonade and punches? @kerry - I made citrus water and after adding the fruit I never stirred it at all. BTW, the fruit ( lemon, lime and oranges ) floats so I had no problem with it interfering with the pour spout. If making drinks with a powdered lemonade or fruit punch mix I would stir it until the powder is dissolved and that's it. I suppose that this might depend on which kind of powder you use and how well it dissolves. Hope this helps. @Kerry I find that different drinks need different amounts of stirring. It really is a personal preference. I personally just make lemonade or ice tea, give it a good stir and enjoy until drained. Enjoy! @Liz - great idea for a gift AND for a delicious beverage! I absolutely love Blueberry season! I have heard there is a bumper crop this year! bumper crop indeed! as we drove by the farm, the bushes looked like blue hydrangea plants the berries were so big and plentiful. it was amazing. blueberry season in july-september, so there is plenty of time to get out there still! I'm looking for something like this only a one gallon jar with pouring ability. Do you have such a thing? @Michele - we don't have a one gallon jar through Daily Grommet. I purchased this water dispenser from one of retail shop. but it had leak. So I retune and went to other retail shop to purchase the store person told me this item had recall because the leak problem. I just want to make sure your item don't have any problem before purchase. @Aki - thank you for posting. We've forwarded your question on to Connie to be sure. Thank you Katherine, Would you please post Connie's comment after you receive answer? I love to purchase since I already made stand for this dispenser. @Aki - I have just spoken with them and there has not been a recall on this product. I am not sure if it is the same product as you purchased originally. Unfortunately, they are also temporarily out of stock on this product. Thank you for the information. I think same product. But I am glad to know there is no problem to purchase this item! HELLO: 1st of all what a great site! 2nd how do you get on a waiting list for items like the BEEHIVE? How much is the product? @ME - 1st of all, thank you for your kind words. We're glad you found us! 2nd I will make sure that you are e-mailed when this comes in using the e-mail you used to post your question. Thank you! Please let me know when this arrives. I would like to order. Looking for an alternative to plastic pitchers this summer? 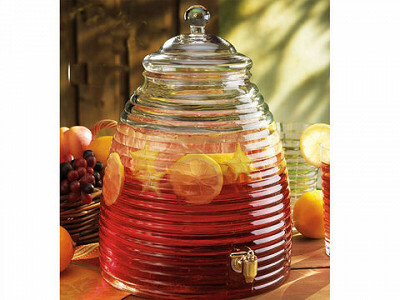 Take a sip from the Beehive drink dispenser, perfect for serving lemonade, sun tea or sangria. The classic beehive shape makes your beverage the centerpiece by showing off fresh fruit and herbs that are kept cool inside the generous but not massive glass jar.